A unique process to get super-clear on who your perfect audience is for your videos (the profitable ones) and what messages they need to hear. In this section you'll discover how the exercise has been applied to different businesses and then revolutionised the messages they deliver in their video marketing so it results in attracting clients who are profitable and great to work with. Prefer to download the video? Here's the link. 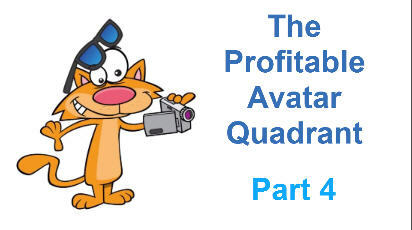 Expected Outcomes: This video is Part 4 of 4 in The Profitable Avatar Series. You'll see case studies that demonstrate either minor tweaks to messages with powerful changes, examples of a complete turn-around and examples when you have more than one avatar. Plan Your Time: 15 minutes for this page. 2 hours for all 4 lessons including doing the exercises. We are often too close to our own businesses to easily take the step back to do this exercise. That's why it helps to see examples of different businesses and how the Profitable Avatar Exercise applies to them. At the end of this lesson you should be more confident to apply the exercise to your own business. Then, the powerful part that makes sure everyone in your business is always clear on who your ideal client is and the messages they need to hear: Download and complete the "Dream Client Summary" provided here. Step 4: Give a copy of the completed "Our Profitable Avatar Summary Sheet" to every person in your business and refer to it when creating your videos. If there are other lessons in this section they will show below. Otherwise, just click the dashboard link in the navigation at the top of the page to explore all modules in the Online Academy.